No, says The Times' David Smith. 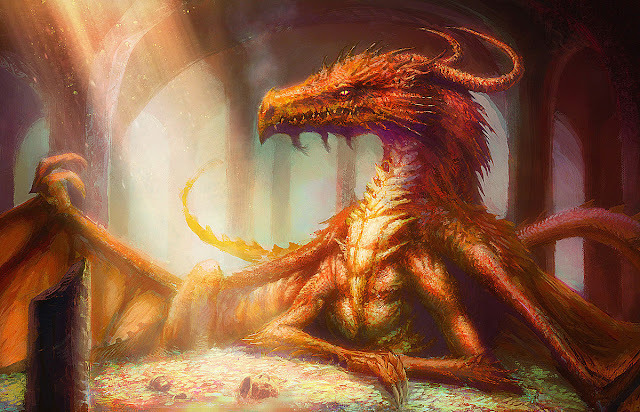 He says that the notion that there was a pause in austerity is an "austerity myth". But the OBR's chart doesn't actually show what I would define as austerity. It shows the size of the government budget as a percentage of GDP relative to previous budgets. That's a good deal of moving parts. And that creates a good deal of ambiguity. Under such a definition, if the economy grows and government spending stays constant, there has been fiscal consolidation. 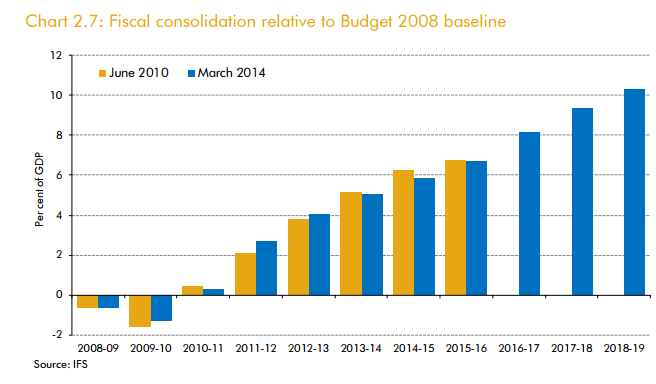 In fact, if the size of the budget grows but the economy grows more, there has still been "fiscal consolidation". What I am referring to when I claim that Osborne paused austerity in 2013 is the pause in the slashing back of government spending. 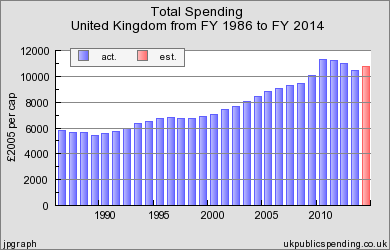 Simply, up 'til 2013 the government was year on year cutting spending in real terms. The bottom came in 2013. In 2014 and 2015 — prior to the election — the government stopped cutting spending. This shows much the same thing. During the Coalition years, revenue and transfers per capita remained relatively static. Spending fell throughout 2010, 2011 and 2012, bottomed out in 2013 and remained static through 2013 and beyond. 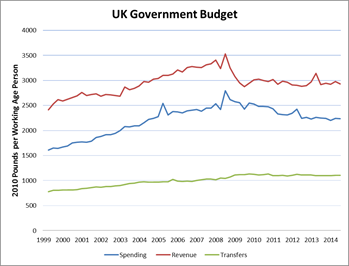 In other words, shake your fist all you like about the OBR's picture of fiscal consolidation, but the actual data on spending and transfers relative to revenue shows a pause in the austerity after 2013. And no, that doesn't mean Osborne literally abandoned austerity altogether. He didn't reverse the cuts, if that's what someone might mean by "abandoning austerity". And the Tory manifesto promises more cuts henceforth. If that's what Osborne and co deliver in the coming parliament then that is the very opposite of "abandoning austerity". But it does mean that the uptick in growth during 2014 is correlated with the pause in austerity. And it does mean that Paul Krugman is correct to say that the UK government "paused", and Simon Wren-Lewis was correct to talk of a "suspension" in austerity. 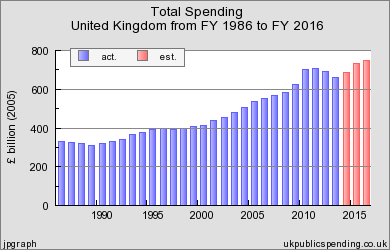 The discussion here is framed in terms of real rather than nominal spending. The story looking at nominal changes is different - implying that the differences in inflation tend to drive the view that is taken. It is difficult to consider that changes in inflation have much to say about austerity. Also, the differences in deficit reduction has tended to be driven by the variability in receipts rather than changes in spending. And here the enormous tax cuts we have seen since 2007-08 in direct taxation - income tax and corporation tax - probably had more to do with this than the commonly held view of austerity which tends to be about spending. If anything, the pause in austerity becomes even clearer. I suppose it all depends very much on how one defines "austerity." If I cut spending, that's austerity. If I keep it low, it's not? Does "pausing austerity" mean suspending further planned cuts? I should think this makes sense but, were further cuts actually planned? And how do we measure cuts? In real per capita terms? From the graph I supplied, there is a sense in which austerity seems to be fully in place throughout the latter part of the sample. That is, normally, one would expect real per capita spending to rise roughly in line with GDP. But in the picture I draw, this is clearly not the case: spending in real per capita terms flat lines, relative to a (modestly) growing GDP. Good points, David. 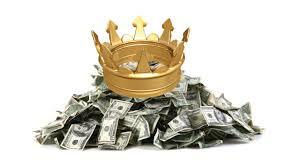 "Austerity" seems to have become an all-purpose term for changes in government spending patterns that may or may not involve actual reductions. They could just be portfolio adjustments. By the way this is John's post, not mine!